The first class of the Longines Global Champions Tour of London kicked off with a win from World Number 1 Harrie Smolders (NED), the Dutch rider claiming the first victory at the Royal Hospital Chelsea aboard his speed horse Zinius. Smolders clinched the win just milliseconds ahead of U25 rider Emily Moffitt (GBR), the young rider just milliseconds behind with Copain du Perchet CH, and third went to Jérôme Guery (BEL) with Hercules By Immofluisteraar. 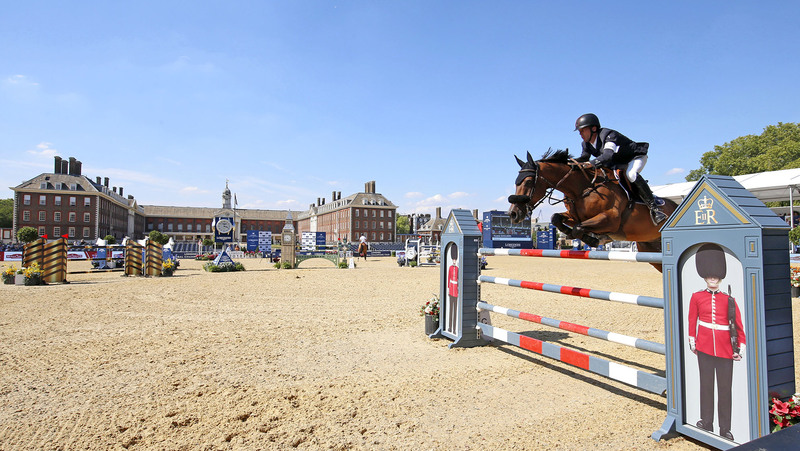 The Royal Hospital Chelsea provides the backdrop to this weekend’s event, the beautiful brick building resplendent in the sunshine as the world’s top show jumpers took centre stage. Uliano Vezzani put together a simple but technical enough course for the first competition in the United Kingdom’s capital city. The 1.45m two phase class featured a triple combination set down the long side of the beautiful VIP hospitality, a wide Longines oxer, and an eye-catching “Big Ben” vertical. First to go clear Simon Delestre (FRA) and Hermes Ryan looked in fine form, the pair setting themselves up nicely for the weekend to come. Christian Rhomberg (AUT) with Redley Kerfontaine soon put in a realistic time, completing the second phase in 25.40s and setting the bar for the rest of the international field to come. Georgina Bloomberg (USA) with Manodie II H soon slotted in behind after a beautiful clear, stopping the clock in 29.83s. Emily Moffitt (GBR) with Copain du Perchet CH soon rocketed to the top of the leaderboard - the young British rider putting in a foot perfect performance with the striking black horse to shave milliseconds off Rhomberg’s time to set the new time to beat at 24.42s. Other impressive clears came from Anna Kellnerova (CZE) with Balguero, Ben Maher (GBR) with Explosion W, William Whitaker (GBR) with Utamaro d Ecaussines, Christian Kukuk (GER) with Colestus, Piergiorgio Bucci (ITA) with Alicante, Emil Hallundbaek (DEN) with Chalisco, Alexandra Thornton (GBR) with HHS Figero, Victoria Gulliksen (NOR) with Deville, Bassem Hassan Mohammed (QAT) with Argelith Squid, Maurice Tebbel (GER) with Chaccos’ Son, Eduardo Álvarez Aznar (ESP) with Uqualin du Saulcy, Eric Lamaze (CAN) with Coco Bongo and Daniel Coyle (IRL) with Cita to name just a few. The next class, the GCL London first round will kick off at 16:30 local time (17:30 CET) with all the action streamed live on GC TV and on the official GCL FB page.